10% of all sales through this site will go to Chessie Rescue towards helping Chesapeakes in need. 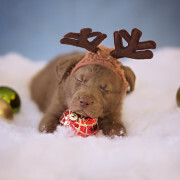 Chesapeake Bay Retriever Resource Center is all-things Chesapeake. Created by Chesapeake owners and enthusiasts to help share information on this wonderful breed. Thank you to all the wonderful photographers and Chessie owners who contributed their imagery to this site. All photos are copyrighted by their respective photographers. They are not to be copied or used without consent.